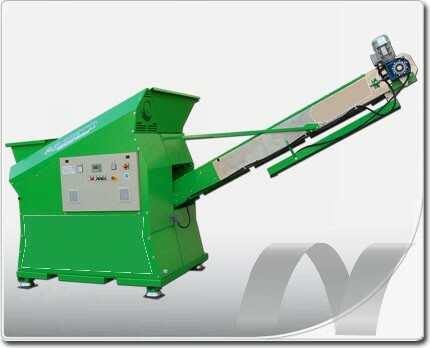 Our new series of shredders, characterized by a “HIGH CUTTING EFFICIENCY”, thanks to the various combinations of shaft, power, screen-size, magnetic separation, etc, can process different kinds of materials: electric cables with either copper or aluminium, non-ferrous metals, rubber, plastic materials, wood, composite materials, paper etc. the production capacity ranges from 300 to 3000 kg/h. A conveyor belt, equipped with magnetic pulley or overband, can be fitted to the machine, removing iron parts and thus avoiding damages to the blades.